The Bearcats look to bounce back after a tough loss at Louisville, and nearly a week off, as they host the Providence Friars Saturday night at 8 on ESPNU. The Friars are coming off a huge win over Connecticut Wednesday. The Friars and Bearcats are both 4-4 in the Big East. This is a pivotal game as a result. The first round bye is huge in the Big East tournament, and there is some other tournament in March. How do the 13-7 Bearcats and 12-8 Friars stack up? What a great question. See the answer after the jump. Last thing. If you want to read about Providence until your eyes bleed, check out our good friends FriarBlog and Friars Basketball. I'm pretty sure there's nothing to do in Rhode Island besides talk about Providence and watch Family Guy. The Bearcats seem to match up with the Friars quite well. The Friars biggest defensive deficiency is offensive rebounds allowed, which is the Bearcats main offensive play. In fact, the put back is Yancy Gates second best move around the basket. The Friars pose an interesting question on offense for Cincinnati. This could be like a Notre Dame situation where the Cats shut them for 40 minutes. Or, it could be a Seton Hall situation where Cincinnati can't get stops on PC. The Friars need to keep Cincinnati off the glass, and force tempo. If they can get UC into forcing up 3s, it would be to their advantage. I see 3 factors needed for Bearcats victory. Deonta Vaughn needs to be more involved in the offense. He had 12 against Louisville, but he only made 4 shots. We need active Deonta. Lance Stephenson can't disappear. Lance was the best player in America the first 6 minutes of the Louisville game, and then he was a ghost the second half. I don't know if the Cards got in Lance's shorts and didn't let him score, or if Lance has ankle problems still or what. 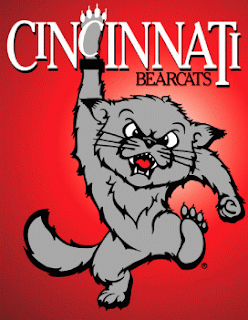 The Bearcats need their star to be their star, or they are going to end up with more Ls. The point guards need to play well. Providence doesn't force many turnovers, but they get quite a few steals. Jaquon Parker looked like the Louisville press got to him halfway through the first half, and didn't have much of the confidence that he showed against South Florida. Cashmere Wright scored well against Louisville, and I would like to see him come back strong again. Dion Dixon was shaky Sunday, but my best friend needs to bounce back. He had a horrible 2 minutes that might have cost UC the game. Let's see #3 do something big. The Bearcats can't really afford to lose home games if they are going to lose every Big East road game. The Friars are looking to make a run towards the top 6. I think this game is going to be tight, until the end.